↑ 2.0 2.1 2.2 "China blasts: Casualties as Tianjin shipment blows up". BBC News. 12 August 2015. Retrieved 12 August 2015. ↑ Graham-Harrison, Emma (12 August 2015). "Explosions in Chinese city of Tianjin kill at least 17 and injure hundreds". The Guardian. Retrieved 12 August 2015. 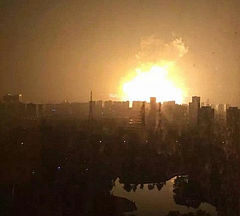 ↑ "Huge explosion in Chinese port city of Tianjin". The Guardian. 12 August 2015. Retrieved 12 August 2015. ↑ "Blast Rocks Chinese City of Tianjin, Hundreds Reported Injured". NBC News. 12 August 2015. Retrieved 12 August 2015. ↑ "Update 10-Huge blasts at Chinese port kill 50, injure more than 700". Reuters. 13 August 2015. Retrieved 13 August 2015.